When single mum Ebony Vincent moved on to one of Britain’s most notorious estates, she couldn’t be blamed if she’d just bolted her door on all its troubles. After all, the crime-ridden Beaumont Estate is in one of the most deprived areas in the country, teenage pregnancy and unemployment rates are among the highest and drug abuse is rife. Within days of moving in, Ebony found herself trying to explain to young daughter Lucia, now seven, why there were flowers on the blood-stained pavement outside, marking the spot where a teenager had been stabbed to death. 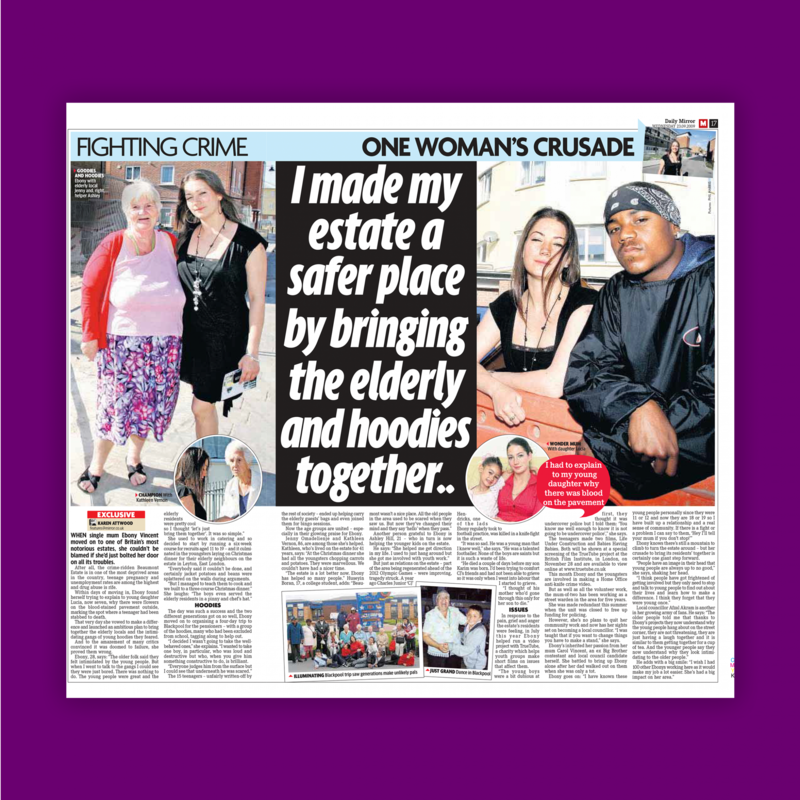 That very day she vowed to make a difference and launched an ambitious plan to bring together the elderly locals and the intimidating gangs of young hoodies they feared. And to the amazement of many critics convinced it was doomed to failure, she proved them wrong. She used to work in catering and so decided to start by running a six-week course for recruits aged 11 to 19 – and it culminated in the youngsters laying on Christmas dinner for their elderly neighbours on the estate in Leyton, East London. “Everybody said it couldn’t be done, and certainly jacket potatoes and beans were splattered on the walls during arguments. The day was such a success and the two different generations got on so well, Ebony moved on to organising a four-day trip to Blackpool for the pensioners – with a group of the hoodies, many who had been excluded from school, tagging along to help out. “I decided I wasn’t going to take the wellbehaved ones,” she explains. “I wanted to take one boy, in particular, who was loud and destructive but who, when you give him something constructive to do, is brilliant. The 15 teenagers – unfairly written-off by the rest of society – ended up helping carry the elderly guests’ bags and even joined them for bingo sessions. Now the age groups are united – especially in their glowing praise for Ebony. Jenny Omadelienje and Kathleen Vernon, 86, are among those she’s helped. Kathleen, who’s lived on the estate for 41 years, says: “At the Christmas dinner she had all the youngsters chopping carrots and potatoes. They were marvellous. We couldn’t have had a nicer time. Another person grateful to Ebony is Ashley Hill, 21 – who in turn is now helping the younger kids on the estate. But just as relations on the estate – part of the area being regenerated ahead of the 2012 Olympic Games – were improving, tragedy struck. A year ago Charles Junior ‘CJ’ Hendricks, one of the lads Ebony regularly took to football practice, was killed in a knife-fight in the street. “It was so sad. He was a young man that I knew well,” she says. “He was a talented footballer. None of the boys are saints but it is such a waste of life. “He died a couple of days before my son Karim was born. I’d been trying to comfort CJ’s friends and had not been able to grieve so it was only when I went into labour that I started to grieve. In response to the pain, grief and anger the estate’s residents were feeling, in July t h i s year Ebony helped run a video set project with TrueTube, a charity which helps youth groups make short films on issues that affect them. “The young boys were a bit dubious at first, they thought it was undercover police but I told them: ‘You know me well enough to know it is not going to be undercover police’,” she says. This month Ebony and the youngsters are involved in making a Home Office anti-knife crime video. But as well as all the volunteer work, the mum-of-two has been working as a street warden in the area for five years. She was made redundant this summer when the unit was closed to free up funding for policing. However, she’s no plans to quit her community work and now has her sights set on becoming a local councillor. “I was taught that if you want to change things you have to make a stand,” she says. Ebony’s inherited her passion from her mum Carol Vincent, an ex Big Brother contestant and local council candidate herself. She battled to bring up Ebony alone after her dad walked out on them when she was only a tot. Ebony knows there’s still a mountain to climb to turn the estate around – but her crusade to bring its residents’ together is certainly one giant step forward. “People have an image in their head that young people are always up to no good,” she says, shaking her head.